Cupcake cookbooks abound on the bookstore shelves and a couple or so years ago, there was talk that the trendy cupcake was coming out of style. If it is indeed coming out of style, it’s a slow death: people don’t seem to let go of their treats as easily as a fashion piece that was stylish or fashionable back in its heyday but now outdated or only suitable for a costume party. Food trends come and go, they dictate our culture, but there are some things that shall remain classic, no matter how many grand, ritzy reincarnations it goes through and that includes cupcakes. When we were kids and ate cupcakes, or any treat for that matter, we didn’t care if it was fashionable or not. We just ate because we enjoyed eating – and, shouldn’t that be the point? Until Elana Amsterdam’s newest cookbook Gluten-Free Cupcakes hit the market, though, gluten-free folks were missing out on the party. 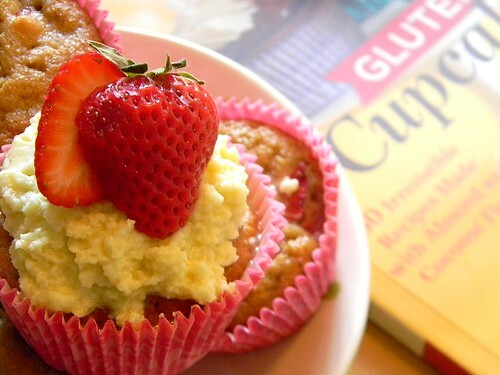 If you Googled for gluten-free cupcakes there are lots of search results for online recipes but, until now, no gluten-free cupcake cookbooks. Using nothing but coconut flour and almond flour (some recipes use a combination of the two flours, others simply use one kind) with the occasional use of arrowroot powder for binding or thickening, no fillers, no gums – a recent issue with gluten-free baking as some are unable to digest xanthan and/or guar gum properly, which are traditionally used to bind and mimic gluten – the recipes are simple but also decadent and sure crowd pleasers. 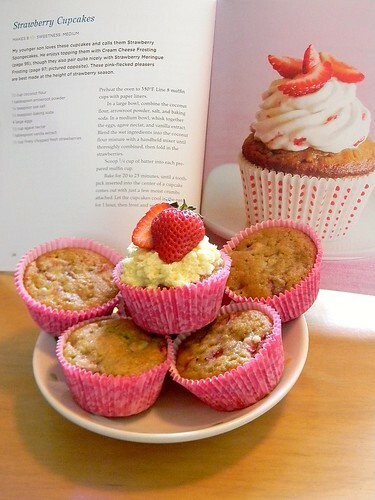 So far, we’ve made the strawberry cupcakes and marbled cupcakes (both use just coconut flour). Yesterday I made the strawberry again – you can tell it’s a favourite – and after they’d cooled, my brother ate most of the batch, without any frosting of any sort. This is a clear indication of how tasty they are! The rest of my family loved them as well, the first time I made them we ate the cupcakes with the meringue frosting (only deviating from Elana’s recipe in that I used honey and made it Italian style) and a French vanilla buttercream frosting I made from scratch. We’re also eyeing the ice cream cone cupcakes – now just searching for the gluten-free ice cream cones! They’d be perfect for a birthday party or any occasion where there would be little kids. 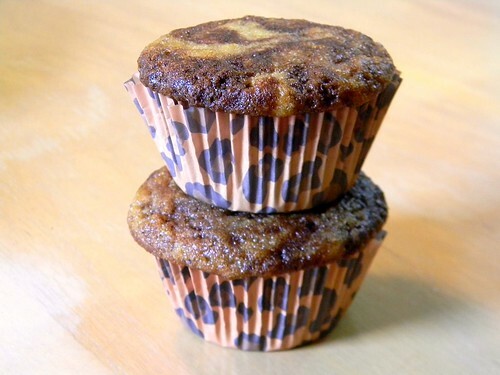 For those who don’t have much of a sweet tooth or are in the mood for something more savory, there are also muffins (referred to as “savory cupcakes”) such as spinach feta and breakfast bran muffins. 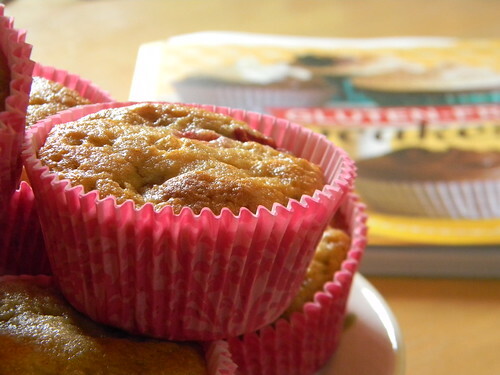 It’s easy to say that this is the only cupcake cookbook, let alone gluten-free, that you’ll ever need. In fact, this is the only cupcake cookbook in my possession and it’s worth owning! I keep going back to it for ideas and for picking what cupcake I’ll make next. I love your pictures! They are so fresh and tasty-looking. I love those recipes too, and I still need to try the marbled cupcake. It looks so elegant. YUM YUM! Elana’s books are fabulous and quickly becoming the most-often used cookbooks on my shelf! Thanks, Sea! The book is often on the table, not even in my bookshelf with all the other cookbooks. I flip through it quite frequently! Hi Kathy, thanks for letting me know – I just have to find them now. 🙂 I’ll be on the lookout! Elana also lists resources for company products she uses, including gluten-free ice cream cones. great review of Elana’s book, Zoe! I also love it that there are popular g-free cupcake books out there, 5 years ago I never thought I would see the day. Your pictures are fabulous and are making me really want cupcakes!! 🙂 I don’t have Elana’s book yet, but hopefully soon! Thanks, Melanie! Elana’s book is completely worth having. 🙂 You won’t be disappointed. Great review and awesome photos! I had to do a double take to make sure those were your photos and not a photo from the cookbook because they looked so professional, and the cupcakes looked so cute! Thanks, Kim! Coming from you, who has had made Elana’s cupcake recipes and done a giveaway – I can only imagine the torture. 😉 You must let me know if these freeze well, although I don’t think I ever could freeze them: practically all the treats I make are gone within the day or the next, unless they’re hidden away (and even then that’s not a guarantee). 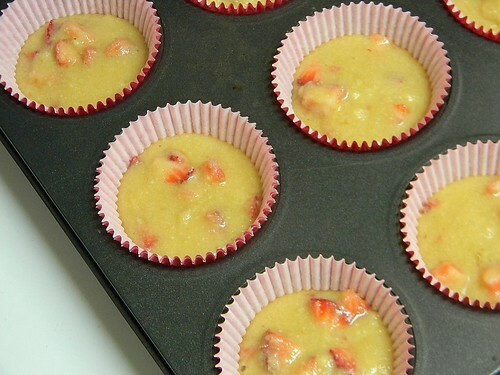 These cupcakes are the perfect bring along snack in the car when you don’t have time for a sit down breakfast. I have never had such a nice moist blend with the strawberry one and the icing is almost superfluous because the content is so good. 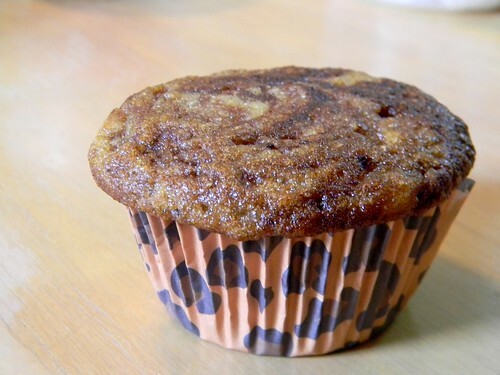 I think these would make great mini-muffins, too with blueberries. Thanks for a great find! The one that’s on the top of my to-make list are the triple chocolate cupcakes. They look scrumptious, like a monster-sized chewy chocolate chip cookie or even a brownie but as a cupcake! SO HUNGRY right now. Why can’t the internet have Taste-o-Vision? Or a Reach-Out-and-Grab app? Those perfectly-poised strawberries, the stackable marbled lusciousness, the frosting that’s just the right amount–love it. I know several people who have discovered that they need to follow a gluten-free diet or really, really be sorry; it’s good to know that we’re getting more and more options. One of our local supermarkets has been expanding their gluten-free section from a single shelf to a whole row! Imagine! So far I am not under any edict to be gluten-free, but this stuff tastes so darn good I stray toward it anyway. And now there’s a cupcake cookbook. Awesome. I just got to your blog, so this may be done & done, but if you aren’t already a cookbook-publishing-guru, you need to be, because those photos are exquisite, and I have a feeling any cookbook by you would be entertaining AND delicious. Hi Beki, thank you! I believe I just left out the arrowroot powder and didn’t use it, since it was such a small amount called for. It probably did make a bit of a difference, but only slightly. Nothing drastic.